This new volume of the collection Small animal surgery is a selection of the main surgical procedures explained in the previous volumes. The greatest asset of this book is that it is based on high-quality videos, which accompany each of the surgical techniques. These are classified according to degree of difficulty. 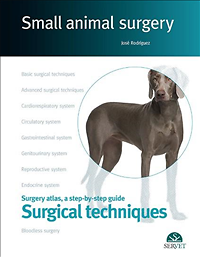 This book is the result of the authors thorough and careful work and is an essential resource both for veterinary professionals in practice and students of veterinary surgery. Small animal surgery: Basic principles and techniques. Surgery atlas, a step-by-step guide.